Last week SIPRI released new data on international arms transfers, which showed that the volume of international transfers of major weapons increased by 8.4% between 2007–11 and 2012–16. Together, the USA and Russia supplied over half of all major arms exports. The Middle East and Asia and Oceania were the largest regional importers. SIPRI published a new report examining the collaboration between African and external stakeholders on peace operations in Africa. The report finds that the collaboration is not equally balanced—with external actors making decisions and African states providing personnel—and suggests pathways to improve future collaboration. SIPRI published a report examining China's motivation for its Silk Road Economic Belt initiative and the possible security implications for Central and South Asia. The report provides policy recommendations to the EU. 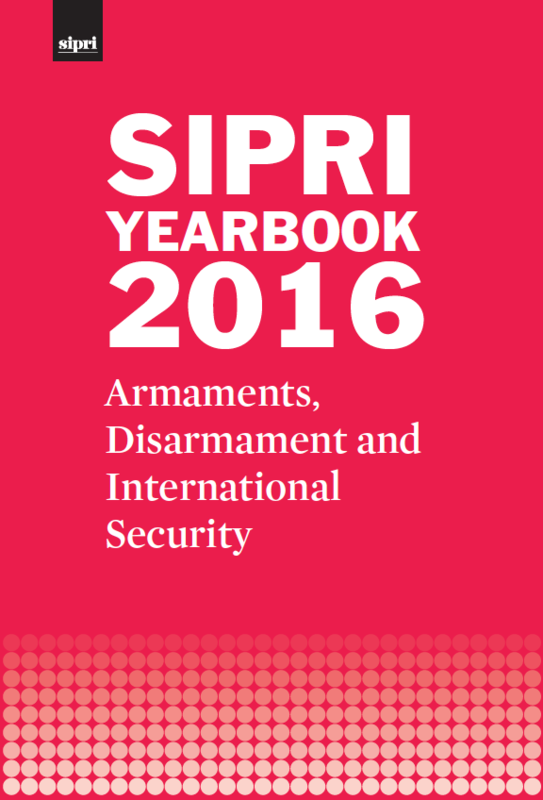 The Ukrainian translation of SIPRI Yearbook 2015 was launched at the Razumkov Centre (Ukrainian Centre for Economic and Political Studies) during the conference 'Security Sector Governance: Defence Production, Sales and Acquisitions' on 2 February. SIPRI is pleased to announce that Espen Barth Eide has joined the SIPRI Governing Board. Mr Eide is a Norwegian politician and political scientist and is currently United Nations Special Adviser on Cyprus. 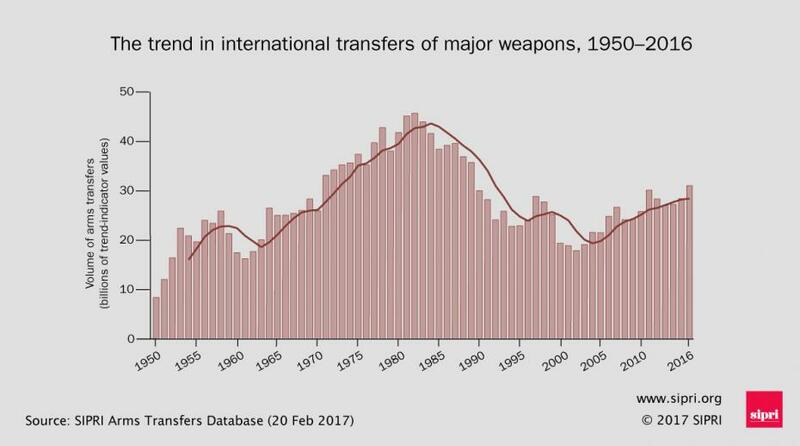 Using the latest SIPRI data, this blog post looks at some of the key trends in international transfers of major weapons through 8 graphics. The focus of this year's Munich Security Conference was the West. SIPRI Director Dan Smith reflects on the general mood and messages from the conference. In 2015 the EU, Russia, the USA and Iran agreed the Joint Comprehensive Plan of Action, regulating Iran’s nuclear programme and lifting sanctions. Now tensions are rising again. Against this background, Tarja Cronberg provides a strategic analysis of 12 years of EU nuclear negotiations with Iran. Following the release of its latest data on international arms transfers, SIPRI will co-host an event in Washington, DC, on the global arms trade. The event will look at how the arms trade impacts US national security and foreign policy. In cooperation with the Swedish Ministry for Foreign Affairs, SIPRI hosted an event on the Comprehensive Nuclear-Test-Ban Treaty and the future of nuclear testing. The event was opened by State Secretary for Foreign Affairs Annika Söder. It included perspectives from Executive Secretary of the Comprehensive Nuclear-Test-Ban Treaty Organization Lassina Zerbo, and former Minister for Foreign Affairs and IAEA Director General Hans Blix. SIPRI launched the publication Reintroducing Disarmament and Cooperative Security to the Toolbox of 21st Century Leaders at a seminar in Vienna. Organized by the Vienna Center for Disarmament and Non-Proliferation, the seminar brought together experts to discuss how dialogue and disarmament diplomacy can contribute to responding to national security interests. SIPRI and the Mapping Institute facilitated a workshop to discuss a new data platform designed to help target and coordinate peacebuilding and recovery initiatives in the Donbass region of eastern Ukraine. The platform will be used by the Ukrainian Ministry for Temporarily Occupied Territories and Internally Displaced Persons and the beta version will be launched in April. It is funded by the UK Department for International Development and administered by the World Bank. The SIPRI Arms Transfers Database now contains information on all international transfers of major conventional weapons from 1950 to the end of 2016. It is the only publicly available resource providing consistent data on international arms transfers for this length of time. This Fact Sheet describes the trends in international arms transfers that are revealed by the new data. It lists the main suppliers and recipients for the period 2012–16 and describes the changes in regional trends. This report examines the Silk Road Economic Belt from a security perspective. It has three components: (a) it analyses what the Belt essentially is, what has driven China to initiate it, and how it relates to China’s own security interests; (b) it assesses what the Belt’s security implications are and might be in Central and South Asia; and (c) it elaborates on whether the Belt is a platform for EU–China cooperation on mitigating security threats throughout Eurasia and provides policy recommendations to the EU on how to proceed. The concept of disarmament has failed to remain high on the agenda of policymakers. This publication on disarmament and cooperative security opposes conventional thinking that equates national security with the modernization and build-up of military capabilities. It aims to rehabilitate disarmament and arms control mechanisms as a cornerstone of national security and international stability. Africa has increasingly become the focus of peace operations and, by extension, the main arena for new developments and approaches in them. Largely based on six dialogue meetings with participants from different regions in Africa, this report examines perceptions of the future of peace operations on the continent. The report’s findings seek to outline pathways to improve future collaboration between African and external actors, and to strengthen their mutual understanding.